My mum has the biggest sweet tooth ever and will often order a starter instead of a main meal to make sure she has maximum room for dessert! So on special occasions it's never difficult to think up something to make for her, since she loves pretty much anything sweet. One of her favourite things though is the strawberry cremes from Roses, so for Mother's Day I decided to make some cupcakes inspired by her favourite chocolate! These are straightforward chocolate cupcakes decorated with strawberry buttercream from a Lola's Cupcakes recipe. It's basically buttercream with 4 mashed up strawberries beaten in. 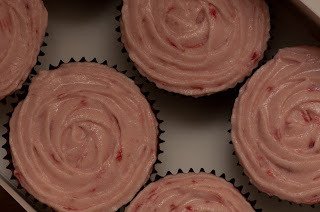 It gives the buttercream a zingy fresh strawberry flavour and a lovely natural pinky colour. My only niggle was the buttercream was quite sloppy so the rose piping didn't stand out as much - with hindsight I might add more icing sugar in future if I want to pipe it nicely... or stick it in the fridge for a bit. Oreo baking: United Bakes of America! 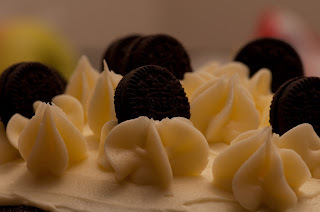 After much comment-drooling over Oreo bakes I've seen on other blogs, when the theme for my first ever Clandestine Cake Club in February was 'All Your Favourite Things' it just HAD to be Oreo related. I don't know where my Oreo obsession came from, I'm not even really a biscuit person and even then I'm more partial to a Malted Milk or plain old Digestive! Since it was my first one I decided to play it safe and use my trusty chocolate cake recipe (original here on Afeitar's blog) and then just Oreo it up to the max. I crushed up some Oreos and mixed them into vanilla buttercream for the filling, then covered with the buttercream and stuck some mini Oreos into piped blobbed flowers on top (blobbed flowers are fast becoming my cake signature!). I was really pleased with the effect and was quite happy to overhear some lovely comments from people at the cake club on how it looked! 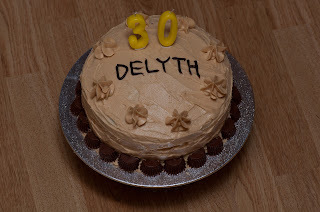 My best friend's birthday is now always a reason to bake, but since it was her 30th this year I wanted to make something extra good! Since she is a big peanut butter/Reese's cups fan I decided to try to make a cake version of them. 1. Beat the butter and peanut butter together until light and fluffy. 2. Gradually beat in the icing sugar. 3. Mix in a little milk a tablespoon at a time.